Every golfer knows what it feels like to strike the ball on the golf club's “sweet spot” (though some enjoy this feeling more often than others). Aside from the great sensation the sweet spot creates, why is hitting it so important? Basically, the sweet spot is the most efficient part of the golf clubface at transferring energy to the ball. In other words, a shot that hits the sweet spot will travel farther than a shot that misses it (with the same swing speed). The sweet spot is about more than distance, though. Since the club doesn't vibrate or twist on a sweet spot strike, the ball launches on a straighter path than when it's hit with the toe or heel. Backspin is maximized by the sweet spot while sidespin, which robs distance and accuracy, is minimized. Not every shot hit on the sweet spot turns out perfect. If the clubface isn't square to the target at impact, even a pure strike will create sidespin. More often than not, though, a swing that finds the golf club's center is rewarded with a solid result – not to mention that wonderful, cushion-like feeling that keeps golfers coming back for more. What's So Sweet About the Sweet Spot? If you've heard it once, you've heard it a million times – you need to hit the sweet spot in order to hit good shots. But why? What is it about the sweet spot of your clubs that leads to great golf shots? Well, there are actually a number of reasons why this part of your golf club is so powerful. If you can regularly put the ball on the sweet spot at impact, you will find that more and more of your shots head directly for their target. Of course, no golfer is going to be able to hit the sweet spot every time, so you can always strive to get better at this crucial skill. When you think about the sweet spot on your clubs, you probably first think about distance. Of course, if you can strike the ball on the sweet spot, you are likely to get maximum distance as compared to hitting the ball on the toe or the heel. Players who consistently launch long drives from the tee usually are able to find the sweet spot time and again – and if they miss it, they don't miss it by much. It can be frustrating to make a powerful swing only to see your ball flight a relatively short distance because you missed the sweet spot when impact arrived. If you are interested in maximizing your distance (of course you are), you should work hard to find the sweet spot as frequently as possible. While distance is the first thing that comes to mind, making contact in the middle of the face actually offers more benefits than just raw power. If you can find the sweet spot when you come through impact, you will stand a far better chance of hitting your ball toward the target – which is the whole point of the game in the first place. When you miss it off the toe or the heel, you are likely to generate extra side spin which will curve the ball off target quickly. That means not only will off-center hits cost you valuable yardage, but they will cost you accuracy as well. By now, it should be very clear – making great contact on the center of the face is the only way you can expect to hit good golf shots on a regular basis. It is going to come down to your fundamentals when determining if you will be able to find the sweet spot as often as you like. You might be able to 'luck' your way into good contact once in a while with bad mechanics in your swing, but those shots will be the exception rather than the rule. In order to regularly locate the sweet spot at the bottom of the swing, solid fundamentals are essential. By putting in the work on the range to solidify your technique from a mechanical standpoint, you can make it far more likely that your sweet spot will be involved in the shot. Before we get into some tips that will help you hit the sweet spot more frequently, we should take a quick look at exactly why the center of the club face is the ideal place to strike the ball. It is always helpful to have a clear understanding of how things work in golf, even when it comes down to something as commonly accepted as the importance of the sweet spot. The sweet spot is found in the center of your club face because of the weighting that is used in the design of the club. Generally speaking, the majority of the weight in your clubs is going to be found around the perimeter – specifically, in the toe, the heel, and the sole. If your clubs are near by, take your seven iron out of the bag and look it over for a visual representation of this idea. Most likely, there is more material in the toe, heel, and sole than anywhere else on the club. The area behind the sweet spot is probably hollow, assuming you are using some form of cavity back design. This makes for a sweet spot that is larger and more responsive than one you would find on a 'blade' design. Perimeter weighting is something that has made the game easier for millions of golfers, as it has enhanced the sheer size of what can be considered the sweet spot of the club face. While your driver and fairway woods certainly look different than your irons, they work in much the same way. Since the club head of your driver is hollow, there is nothing behind the face but air when you smash it into the ball. That means the majority of the weight is around the edges and in the sole, leading to a powerful transfer of energy if you are able to contact the ball in the middle of the face. Modern drivers that are 460cc's in size have a large sweet spot, so you can miss the shot off the toe or heel slightly and still achieve reasonable distance. Understanding how the sweet spot works and why it is important may help you pick out the right clubs for your game as well. Using clubs that feature a perimeter weighted design will make it easier to hit the sweet spot, simply because the sweet spot is going to be bigger. 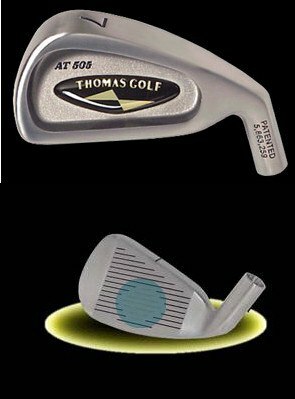 Clubs that have a 'blade' design are harder to hit and have a smaller sweet spot, but they offer great feedback and feel for players who are good enough to make them work. Think about the current level of your game and pick out a set of clubs that is going to offer characteristics which will help lead you to play your best. With clubs that provide you with decent sweet spot, the rest will be up to you in terms of making a swing that will place the club squarely on the back of the ball. It is easy to think about golf as a complicated game, and your mind can get filled up with all kinds of various tips and tricks if you listen to everyone that wants to give you advice. However, the best golfers are those who keep the game as simple as possible. If you think about it, golf is actually a simple game at its heart – the only goal is to place the ball in the hole in as few strokes as possible. Of course, there are plenty of rules between here and there, and you will have to work hard on your technique to achieve success. In order to give yourself a good chance at hitting the sweet spot regularly, use the following swing keys. Never lose your balance. The best way to hit the sweet spot at impact is to keep your balance. That might sound extremely simple, but that's the truth. Sure, there are other important factors, and we will get to those in a moment, but this should always be the point that is at the top of the list. If you can stay balanced from the moment you start your swing until the swing has been completed, you will find it rather easy to hit the sweet spot with regularity. Staying balanced takes care of a lot of the other potential issues that you can have in your game, so this is a great point to focus on because it covers up for so many other possible errors. All great golfers are able to stay balanced during their swings, and you should make it your goal to do the same. Keep your eyes on the ball. This is another one of those tips that seems too simple to actually help you play better golfer. However, keeping your eyes down on the ball is in fact a key piece of the sweet spot puzzle. It is important to note the difference between keeping your eyes down and keeping your head down. It is not necessary to keep your head completely down and perfectly still in the swing – in fact, that can be detrimental to your motion. As long as your eyes remain trained on the ball until it is gone, you can feel free to allow your head to move slightly along with the movement of the rest of your body. Release the right hand. Many golfers fail to hit the sweet spot at impact because they get tentative at the bottom and fail to release the right hand through the shot. This is a shame because these swings have plenty of good elements leading all the way up until impact – only to be undone by a lack of confidence. As your club head is approaching the ball, you need to have the confidence to turn the club loose using your right hand to release the head through impact. Failing to let the right hand release is also known as 'hanging on' to the shot, and you will find that the ball usually floats out to the right when you make this type of swing. Work on building up your confidence at the driving range so you can go ahead and turn it loose when you are out on the course. Keep things tight. A long backswing can be desirable for its ability to add speed to your swing – but that is only going to be helpful if you can still hit the sweet spot with that long swing. If not, consider tightening up your action to make it easier to find the center of the club. Most golfers will find that they are able to the sweet spot more regularly when they use a slightly shorter backswing, so don't be afraid to keep your turn tight as you go back. Most likely, any distance that is lost through a shorter swing will be made up when you are able to hit the sweet spot with greater consistency. It takes skill, practice, and confidence to hit the sweet spot on a regular basis. As you work on your own game, use the tips above to guide your practice and you should find that the ball is coming off the center of the club more and more often going forward. Once you do locate the sweet spot with regularity, you will likely find that golf isn't quite as hard as you used to believe. Golf will never be an easy game by any means, but it is significantly easier when you can put the sweet spot to work. One of the frustrating parts of the game of golf is that it isn't actually good enough to hit quality shots – you have to hit the kind of quality shot that you are expecting. For instance, if you make a great swing and hit the ball dead straight, but you were expecting to hit a draw, the ball is going to wind up wide right of the target. Only when you can correctly predict the type of shot you are going to hit will you be able to be successful. So, what should you expect to see from your ball when it is hit perfectly off of the sweet spot? The following points will give you some indication of the kind of ball flight that should result when you hit one perfectly flush. Your best distance. Simply put, shots hit off of the sweet spot are going to cover more distance than those that are miss-hit slightly. So, with that in mind, you should plan on the ball carrying as far as you are capable of hitting it when you do manage to square it up perfectly. Of course, you shouldn't always expect that outcome, so some margin for error needs to be built in to your shot planning. For instance, if you have 150 yards to carry the water and your eight iron will only go 155 if you hit it perfectly, think about hitting a seven to provide some margin in case of a miss-hit. Yes, a perfectly struck shot will be a little long, but golf is a game that requires you to play the percentages in order to be successful. Less curve in the air. You aren't likely to put much sidespin on the ball when you manage to hit it right on the sweet spot. A ball that is struck nicely in the middle of the face is usually the result of a quality swing, meaning there shouldn't be a dramatic hook or slice coming on the end of the shot. Your ball certainly could (and likely will) curve slightly to the right or left as it flies toward the target, but a dramatic curve is unlikely to occur. That should give you a nice peace of mind knowing that as long as you catch the ball solidly at impact, you should be left with a ball flight that is very much playable. Excellent height. This is probably the most underrated aspect of hitting the ball on the sweet spot. When you catch your shot cleanly, the ball is likely to climb high into the air with a healthy rate of backspin. These types of shots usually stop quickly when they land, making them very easy to control. Shots that are either off the toe or off the heel will usually have a lower rate of backspin, meaning they won't climb as high and they won't stop as quick. If you have ever wondered how professional golfers are able to hit the ball so high in the air on their iron shots, this is a big part of the reason. Yes it helps to have a high club head speed, but it is also crucial to hit the ball right off the center of the face. Not surprisingly, the overall theme is this – you should expect to see beautiful shots coming from your club face when you hit the sweet spot. In golf it doesn't get much better than straight, high, and long. That combination of characteristics can take you a long way in this game, and it all starts by matching up the sweet spot of your club with the back of the golf ball at impact. Does the Sweet Spot Matter in the Short Game? All of the talk so far in the content above has been focused on the long game. But what about the short game? Does it matter if you hit the sweet spot when you are chipping and putting, or is it irrelevant since the ball isn't going to be traveling far? As you would probably guess, hitting the sweet spot remains extremely important in the short game, just as it is with the full swing. Hitting the sweet spot is important in the short game because the short game is all about distance control – and controlling your distance is only possible when you hit the center of the club time after time. Of course, you aren't looking for raw distance with your short game shots on and around the greens. Rather, you are just looking to control the distance that you need in order to place the ball near (or in) the hole. When the ball comes off the toe or heel of the club, you simply can't be sure of how far it is going to travel. Not only will the power that is transferred to the ball be reduced when you miss the sweet spot, but you will also achieve a decreased rate of backspin. There is no way to accurately predict the affect of all of these variables, meaning you are going to have very little idea of how far the ball will go when you miss-hit it in the short game. Fortunately, there is good news on this point – it is far easier to hit the sweet spot while chipping or putting than it is while making a full swing. Where you will be doing quite well if you can hit the sweet spot from time to time throughout a round with your full swing, you should actually be able to hit the sweet spot nearly every time in the short game. The fundamentals required to do so are surprising similar to those listed earlier with regard to your swing technique. You should be nicely balanced while hitting short game shots, you should keep your eyes on the ball, and you should maintain confidence at all times. As long as you keep those keys in mind, the ball should find its way to the center of your club face more often than not. Of course, it would be a little bit too easy if that were the end of the story. The vast majority of the time, you are going to want to hit the ball right off of the sweet spot when playing a short game shot, in order to control distance and spin. However, there are occasions when you should intentionally miss the sweet spot. That's right, intentionally miss the sweet spot. Why would you do such a thing? This technique can come in handy when you are playing down a steep hill and you want the shot to come off as softly and slowly as possible. If you intentionally chip or putt the ball off the toe of the club face instead of the sweet spot, it will receive less speed and you might have an easier time controlling it down a fast surface. This is not a shot that you should attempt to play often, but it has the potential to save you a stroke at just the right time. Every golfer would love to hit the sweet spot more often – that is a statement that holds true from beginning players all the way up to the best in the world. You are never going to experience 100% success with trying to hit the club face, but the game would probably be pretty boring if you did. Continue to work on your swing technique with the help of some of the tips above and you should be able to enjoy more and more occasions where the ball is smashed right in the center of the club.